Understanding contract sizes (lots) is a necessary precursor to understanding the need for high leverage in the Forex market. Each standard lot traded in the Forex market is a $100,000 contract. In other words, when trading one lot in a standard account, a trader is essentially placing a $100,000 trade in the market. Without leverage, most investors would not be able to afford such a transaction. Leverage of 100 - 1 would allow a trader to place the same one lot ($100,000) trade with the post of $1,000 in margin. $100,000 divided by 100 equals $1,000, thus 100 - 1 leverage means that $1,000 of margin is able to control a $100,000 position. Many retail Forex traders today begin their trading in a Mini account. Because standard contracts in the Forex market are rather large, even with 100 - 1 leverage, $1,000 of margin per contract traded is still a bit expensive for some investors. For this reason most retail brokers offer the option of a mini account. As seen in figure 1, $250 is used to hold their current positions, totaling 5 mini lots. $4,736.00 is available for the trader to open additional positions. Because institutions are loaning 99% of the value of a contract to a trader, fail-safes have been put in place to help prevent a trader from going into the negative and owing the institution additional funds. This is commonly referred to as a Margin Call, where typically a client is called upon to send additional funds or the position(s) will be closed at market price. 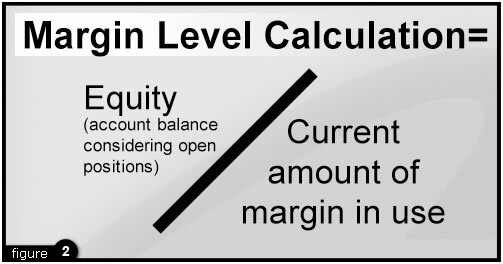 At 50% margin level the trader will be subject to a margin call, the automatic close of open positions so as to bring the margin level back to a suitable percentage. After dividing the equity by the margin move the decimal two places to the right. A trader whose equity is at $1,000 and who is using a $500 of margin would divide 1,000 by 500 which of course equals 2. 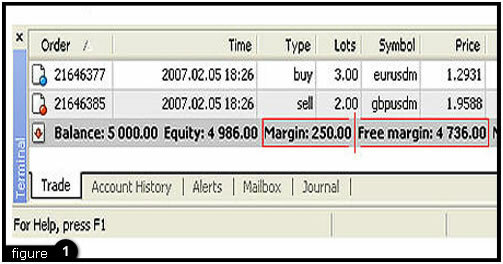 Then move the decimal two places to the right; this trader's current margin level or percentage is thus 200%. At 100% margin level a trader is essentially using their entire available margin. When this level drops to 50% trades will automatically be closed to help ensure that a trader is not subject to losing more money than is held in their account.